AHAHAHAH DONE. Didn't take as long as I thought, I'm not entirely happy with the skin (or her hand), and the background blows, but otherwise, I'm relatively pleased with this. 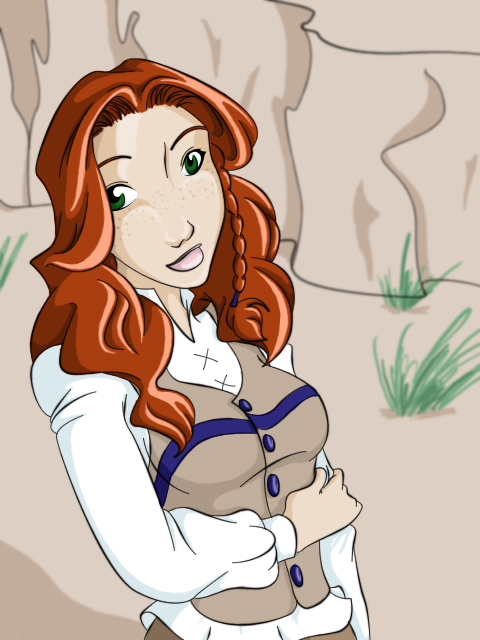 Danae (pronounced dah-nay) is my (currently) only character at Crevice Weyr. She's the rider of green Leth, a journeyman Harper, and a transfer from a mountain weyr called Elbor. She was the youngest daughter of a journeyman Herder, who wasn't too disappointed at losing a child to first Harper Hall and then the Weyr... mostly because his two older children, both sons, became Herders themselves, and so, Danae was left to her own. Not that he didn't love his daughter... and he is happy to see her happy. Danae is mine. Anything Pern-related belongs to Anne McCaffrey.